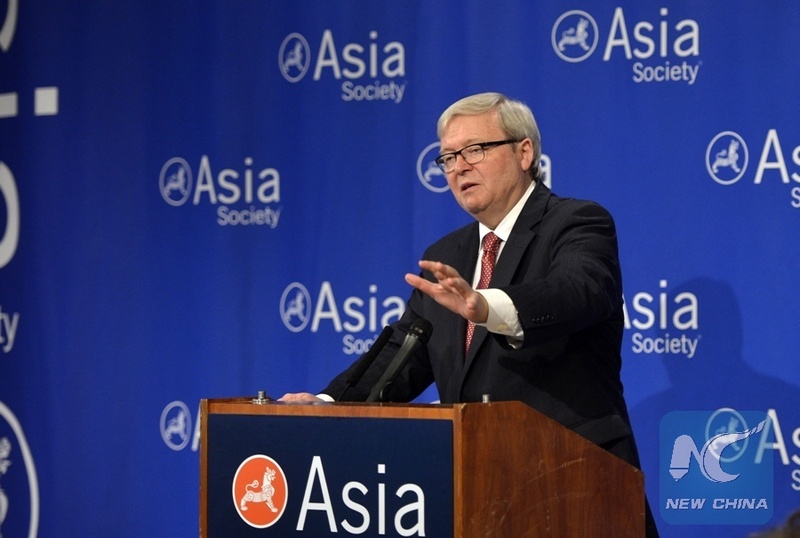 PHILADELPHIA, the United States, April 15 (Xinhua) -- Successfully lifting hundreds of millions of people out of poverty is the most remarkable achievement China made during its 40 years' reform and opening-up, Australia's former Prime Minister Kevin Rudd has said. Rudd made the remarks in an interview with Xinhua on the sidelines of the 2018 Penn Wharton China Summit here on Saturday. Rudd, a fluent Mandarin speaker and now president of Asia Society Policy Institute, designated himself as an "old cadre" who has studied Chinese language, history, and culture for about 40 years. He said he felt fortunate to witness China's profound changes from a poor country to the world's second largest economy. The fact that China has successfully elevated more than 700 million people out of poverty in the past four decades, Rudd said, is an achievement that should be recognized and thumbed up. "Poverty alleviation is easy to say, but very difficult to do," Rudd said, "This is the most remarkable achievement of China's reform and opening-up. Chinese people have every reason to be proud of it." As regards the current U.S.-China trade disputes, Rudd said the United States proposed tariff sanction against China is not just about their trade deficits, but also a reflection of America's anxiety over China's role as a rising economic and technological power. Trade war, however, has no winners, Rudd said. "It is easy to start, very difficult to end, better not start it," Rudd said, "I hope the United States and China could solve their disputes through negotiation." A trade war between the top two largest economies in the world will be destructive to both China and the United States, and overall, to the global growth, he said. The Penn Wharton China Summit was founded in 2016 by students of the Wharton School of the University of Pennsylvania to attract both Chinese and American political and business scholars and students.